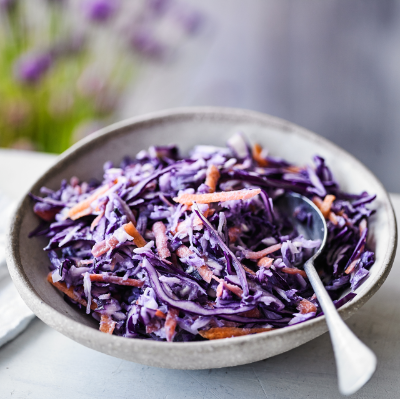 This vegan coleslaw is the perfect addition to your summer BBQ. Slather it on your burgers, toss it on your sandwiches – it’s a great way to pack in an extra hit of flavour to your meals. Preheat the oven to 180oC, gas mark 4. Put the whole garlic clove into a small roasting tin and cook for 10 minutes until it starts to smell fantastic, then remove from the oven and peel. To make the mayonnaise, blend the roasted garlic, mustard, pepper, and soya milk with a pinch of salt until smooth. Next slowly and gently pour in the sunflower oil, with the blender running. Continue to blend until it starts to emulsify into a mayonnaise-like texture. Grate the red cabbage, white cabbage and carrot. Finely chop the onion and mix all together in a large bowl. Add in all the mayonnaise et voila! Coleslaw ready to go!